View photos of Santa Margarita's feral cat colony. SLO County has a cat problem. Stray and feral cat populations have exploded in recent years, most alarmingly in North County, where “community cats” are overwhelming animal shelters, multiplying faster than they can be neutered, and putting a strain on the availability of both natural and human resources. OUT OF CONTROL: A colony of feral black cats lives in Santa Margarita next to the railroad tracks. The “clip” on its ear signifies that it’s been spayed or neutered. Local animal organizations in North County are working hard to curb escalating feral cat populations with “trap, neuter, and release” programs. According to SLO County Animal Services data, more stray animals originate from Paso Robles and Atascadero than from SLO’s five other cities combined (even with 37 percent fewer residents). North County’s unincorporated land is also a big source of stray animals: from 2010 to 2012, 45.5 percent of all the animals taken to the county shelter were found in unincorporated parts of the county. 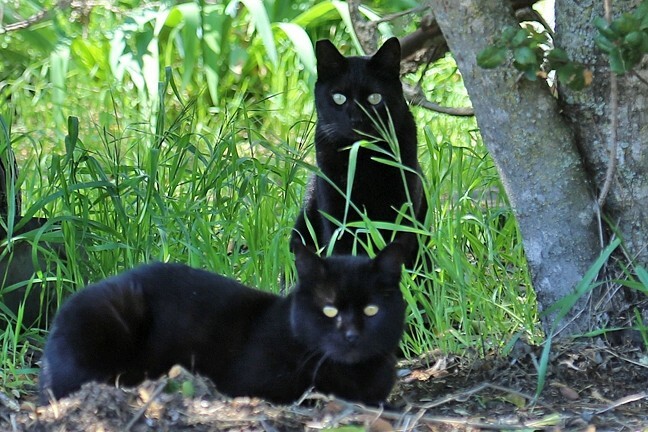 North County is a hotspot for cat breeding thanks to the open, rural land; a reluctance on behalf of residents to claim ownership of cats and shoulder their vet bills; and the absence of an affordable spay and neuter clinic in the area. Jill Tucker, executive director for Woods Humane Society, told New Times that if cats in a particular area aren’t getting altered, it doesn’t take long for their numbers to increase exponentially. Tucker noted that the cats owned and cared for in North County are often unneutered, especially on larger, rural properties, thus those populations can get out of control quickly. Now, a handful of organizations are scrambling to curb the cat population. Paws Cause, an organization based in North County, specializes in the “trap, neuter, and release” practice. Paws Cause first identifies where cat colonies are thriving—from Bradley to Shandon to Santa Margarita—with the help of the public. Then, they trap the feral cats, get them spayed or neutered, then release them back where they originated. It took a long time for that practice to become the norm. Prior, the approach to stray cats in the county was the same as the one used more successfully with dogs: Socialize the animal and get it adopted. That approach proved to be unsuccessful because many feral cats don’t adjust well to domestication, which resulted in low adoption numbers, a spike in euthanasia rates, and it did nothing to solve the population issue. Laura Hughes, director at Paws Cause, called it the “vacuum effect.” New cats moved into recently cleared areas and reproduced. Trap, neuter, and release has proven to be more effective in limiting population growth. North County Humane Society takes a different approach, trapping cat litters and raising the kittens at its shelter in Atascadero. The city of Atascadero allots some money to the organization, which helps pay for the $25 spay/neuter vouchers offered to people interested in getting a community cat (or two, or three) fixed. Even with those efforts, organization leaders say that the long-term solution will simply require more resources and involvement. North County is missing a low-cost spay and neuter clinic, which would assist more people in getting their community cats spayed or altered. Woods Humane Society is currently seeking to fill that need. Tucker said the organization is talking with SLO County about the possibility of leasing a plot of county-owned land in Templeton, with the ultimate intention of building a spay/neuter clinic and shelter there to serve the area. Anderson, director of SLO County Animal Services, believes the addition would be a critical piece of the long-term cat solution. Meow at Staff Writer Peter Johnson at pjohnson@newtimesslo.com or on Twitter at @pljohnson9.